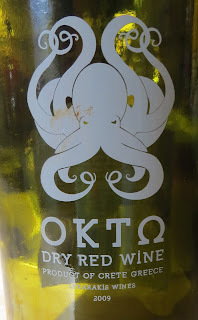 Domaine Lyrarakis Okto Kotsifali from Berry Bros & Rudd smelled almost like a Cotes du Rhone than had run off to join the circus, and ended up in Italy. There was fresh juicy red cherries and dark plums as well as a peppery spice. There was a good hit of ripe tannins, along with some a little firmer. It was dry, but with a sweet fruitiness, and a lively acidity. I liked it, but it seemed to be doing a few different things at the same time, and wasn’t quite together. I suspect it would have been best drunk last year when I bought it, but it’s been lying around, waiting for something to happen, Greek economy style.